My fat story: Did you survive Christmas? Christmas and New Year is all about food, right? There is so much temptations in many forms of sugar. At work there was gifts and it was just candy, candy, cookies and some more cookies. I am so happy that I don't have to buy those things or eat them. I get provoced a lot from people at work who tries to offer me cookies and candy and last week I just got enough and decided that next time someone who knows that I don't eat sugar tries to offer me that I will grab my part and throw it in the garbage. It is my part so I can do what ever I want to do with it, right? I have been blogging a lot at my swedish blog about malnutrition for gastric bypass-operated. I have been translating from english to swedish because a lot of the swedes don't understand medical engligsh and barley in swedish. It is really horrible that everyone who is opererated offers to eat cyanide! This is really bad and I wish that this horrible way of trying to loose weight will be forbidden all over the world. Low carb High Fat-food is a very good alternative and there is so much nice recepies all over Internet! I don't really have to write about that food because the only thing you can do is to google. The hard part is to stay to that food and resist the temptations. But get tempted from good food for you! 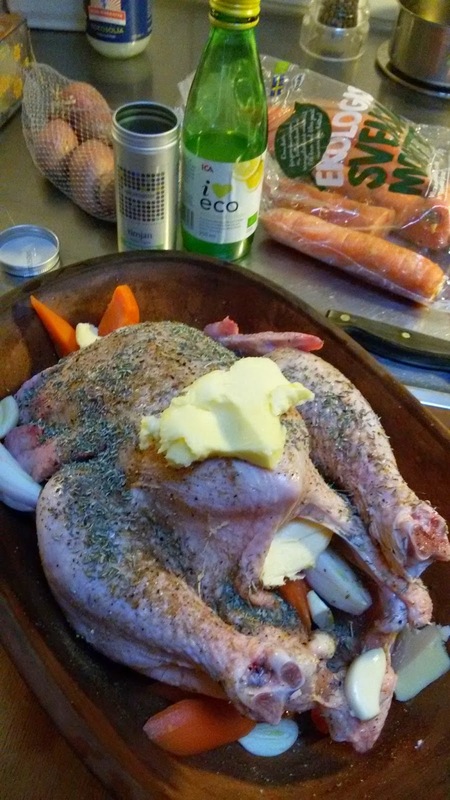 Organic chicken with thyme, garlic, onion, carrots, lemon, pepper and salt. I made "pulled chicken" in my roman pot for 150 Celisus for five hours. To this I reduced the juice from the chicken and made cauliflower-rice. This was a nice dinner I want to tempt you with! My promise for you are to write more here!